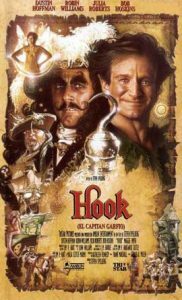 What it’s supposed to be: Stephen Spielberg’s sequel to Peter Pan, in which Peter is all grown up, doesn’t remember his adventures in Neverland, and finds his children kidnapped by Captain Hook, who DOES remember it all. Why it’s a Christmas movie: Peter (Robin Williams) and his family are in London for a Christmas vacation. Of course, it’s not much of a vacation for the workaholic former leader of the Lost Boys, which can only lead to one thing in a Hollywood movie. His children are going to be taken. And they are. At Christmas time. Returning to London at the end, Peter gives his family a great gift: he throws his cell phone into the snow outside. Thoughts: I have problems with this movie. Primarily with the themes, but also with the relationships that women have with peter. But I still enjoy it. It’s escapism, for sure, and the final battle involves Ewok Endor battle levels of suspicion of disbelief . . . but we’re watching a movie about people who fly via use of pixie dust, right? Overall, it’s a solid film in Spielberg’s 90s catalogue.